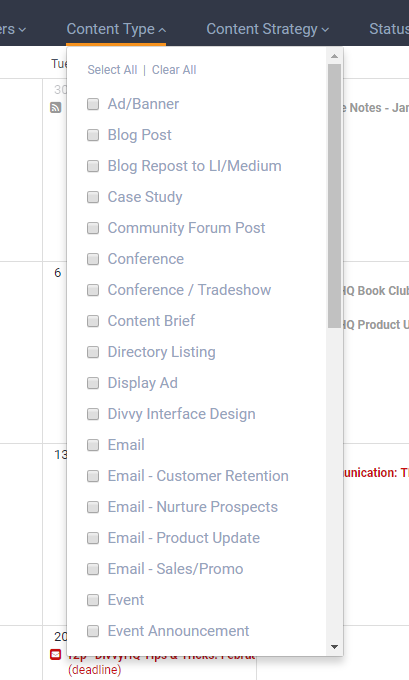 This article provides an overview of the Content Type filter in the DivvyHQ Calendar interface. If your organization is producing a high volume of content each day/week, your editorial calendar view may seem a bit overwhelming. To help you filter down the madness, perhaps the content types filter will help. For example: You want to view just the blog content associated with a certain calendar. A combination of the calendars and content types filter will provide you with that saved view in just a few clicks.